MASTA President Dan Scott (far left) and President- Elect Michael Hopkins (far right) pictured with Teacher of the Year nominee Lynn Brosnan (center left) and 2019 Teacher of the Year award winner Linda Trotter (center right). 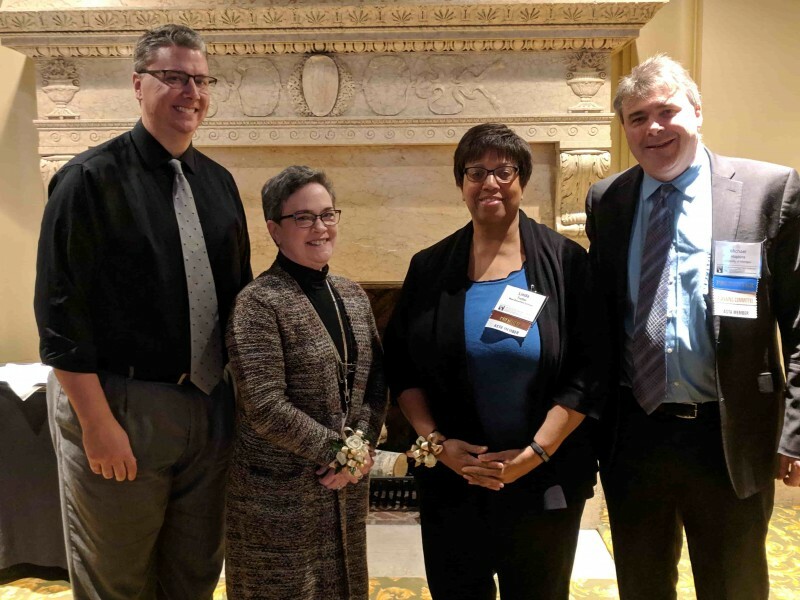 On Friday, January 25, 2019, Linda Trotter, Orchestra Director at West Bloomfield High School & Orchard Lake Middle School was awarded the MASTA 2019 Teacher of the Year. Linda Trotter is finishing her 36th year of public school teaching, spending the last 21 years teaching in the West Bloomfield School District. Many of her students have achieved honors such as being members of the All State Orchestras, MYAF Orchestras, requested to audition as a soloist for MYAF, and as a member of the National Honors Orchestra at Carnegie Hall. Linda has served the Michigan Chapter of the American String Teachers Association for the past 10 years, most recently as the Secretary. Prior to this, she was Project Director for Membership and the MSBOA Liaison for MASTA. In addition, she is on the committee for music commission and the Director Development Days for MSBOA. She has also served her MSBOA District 4 as Vice President of Band and Orchestra Festival, Secretary and Vice President of Orchestra Activities; she also served at the state level as Vice President of Orchestral Activities which includes being the Liaison to MASTA and Secretary/Treasurer. MASTA thanks to Linda for her profound impact on string education in the state of Michigan, inspiring and leading countless students to enjoy, appreciate and excel as string players! On Friday, January 25, 2019, Marcus Leon, Director of Accounting, Brighton Area Schools was awarded the MASTA 2019 Administrator of the Year. Marcus was nominated by Steven Fernandez for his central role in realizing the Brighton community’s long standing, often expressed desire for an orchestra program. In his supporting statement, Steven described how Marcus did an exemplary job preparing the schools for the program’s initiation. He secured ample funds for instruments and equipment, allocated quality classroom space, and ensured that the district would hire a full-time teacher for the program. MASTA thanks Marcus for the amazing work he has done to support the string education of the students in the Brighton Area Schools!